Below I am providing separate html and css code which you can use for customization. If you want to html and css code separately. Then follow this method. It will also work for you. Now time to add css code to your template. You can make changes in HTML code. Simply change the names like home, Blogger, Wordpress with your names and save it and you are done. 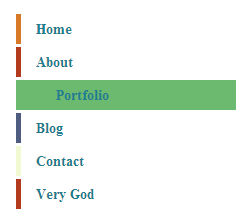 So this was the vibrating animated horizontal navigation menu bar widget for blogger. Please like it and share it and give us your feedback in the comments.